The remote keyless entry keyfob transmits radio waves when the buttons are pressed. The FAA advises radio waves may affect aircraft navigation and communication systems. 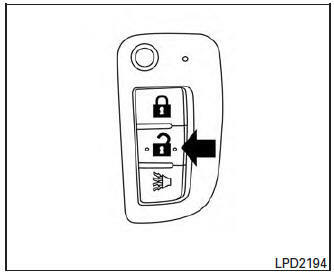 Do not operate the remote keyless entry keyfob while on an airplane. Make sure the buttons are not operated unintentionally when the unit is stored for a flight. It is possible to lock/unlock all doors, turn the interior lights on, and activate the panic alarm by using the keyfob from outside the vehicle. Be sure to remove the key from the vehicle before locking the doors. The keyfob can operate at a distance of approximately 33 ft (10 m) from the vehicle. The effective distance depends on the conditions around the vehicle. As many as four keyfobs can be used with one vehicle. For information concerning the purchase and use of additional keyfobs, contact a NISSAN dealer. The panic alarm will not activate when the key is in the ignition switch. Do not allow the keyfob, which contains electrical components, to come into contact with water or salt water. This could affect the system function. Do not drop the keyfob. Do not strike the keyfob sharply against another object. Do not change or modify the keyfob. Wetting may damage the keyfob. If the keyfob gets wet, immediately wipe until it is completely dry. Do not place the keyfob for an extended period in an area where temperatures exceed 140°F (60°C). Do not attach the keyfob with a key holder that contains a magnet. Do not place the keyfob near equipment that produces a magnetic field, such as a TV, audio equipment and personal computers. 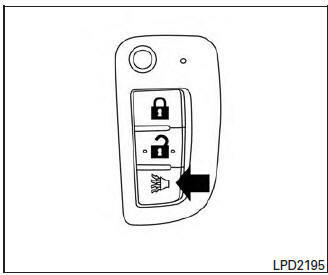 If a keyfob is lost or stolen, NISSAN recommends erasing the ID code of that keyfob. This will prevent the keyfob from unauthorized use to unlock the vehicle. For information regarding the erasing procedure, please contact a NISSAN dealer. Push the LOCK button on the keyfob. All the doors will lock. The hazard indicator flashes twice and the horn beeps once . NOTE: An auto-relock function will operate after a full or partial unlock, when no further user action occurs. The relock will operate approximately one minute after full or partial unlock. 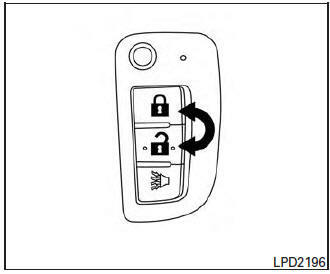 The auto-relock function is cancelled when any door is opened or the key is inserted into the ignition. Press the UNLOCK button on the keyfob to unlock the driver’s door. Press the UNLOCK button again within five seconds to unlock all doors. If you are near your vehicle and feel threatened, you may activate the panic alarm to call attention by pressing and holding the button on the keyfob for longer than 0.5 seconds. The panic alarm will stay on for a period of time. any button is pressed on the keyfob. Press the button on the keyfob once to turn on the interior lights. For additional information, refer to “Interior light” in the “Instruments and controls” section in this manual. If desired, the answer back horn feature can be deactivated using the keyfob. When deactivated and the LOCK button is pushed the hazard indicator flashes twice and when the UNLOCK button is pushed, neither the hazard indicator nor the horn operates. 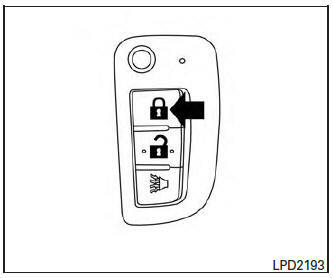 NOTE: If you change the answer back horn and light flash feature with the keyfob, the vehicle information display screen will show the current mode after the ignition switch has been cycled from the OFF to the ON position. The vehicle information display screen can also be used to change the answer back horn mode. For additional information, refer to “Answer back horn” in the “Instruments and controls” section of this manual. To deactivate: Press and hold the and buttons for at least two seconds. The hazard warning lights will flash three times to confirm that the answer back horn feature has been deactivated. To activate: Press and hold the and buttons for at least two seconds once more.